A super-Earth is an exoplanet that is rocky like Earth and other terrestrial planets, but more massive. Typically they are around 5 – 10 Earth masses. Anything much more massive than that, so it was thought, would be massive enough to hold a thick atmosphere, and would likely be a small gas giant. Uranus and Neptune, for example are about 15 Earth masses. But recently we’ve discovered a planet as massive as Neptune that is decidedly rocky like Earth. It has sometimes been referred to as a mega-Earth. 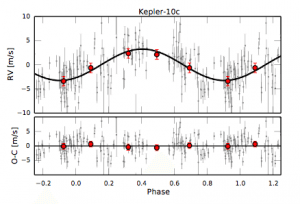 Radial motion due to Kepler 10c. Credit: Dumusque, et al. This particular planet is known as Kepler 10c. 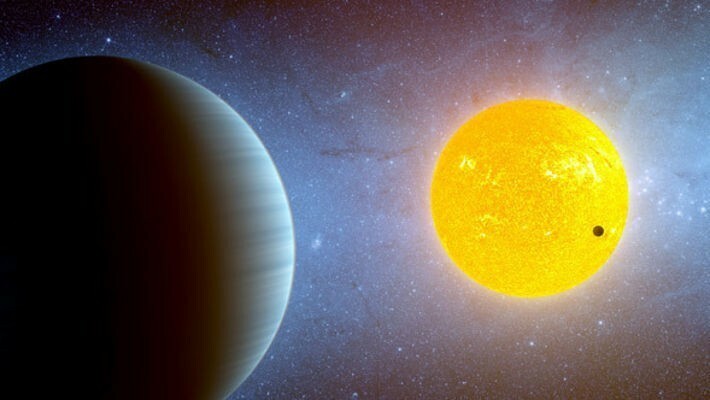 It has been known since 2011, but since the Kepler telescope discovers planets by the transit method (meaning the exoplanet passes in front of its star) we only knew its size relative to the star. 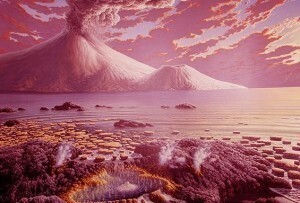 At the time it was discovered that it was a bit more than twice the diameter of Earth, which made it a good super-Earth candidate. But a recent article in the Astrophysical Journal has made measurements of the Doppler motion of the parent star, and has measured the “wobble” of the star due to the planets orbiting it. From this they determined the mass of Kepler 10c, and it was astonishingly large. About 17 Earth masses. Knowing its size and mass, we can calculated its density. This turns out to be about 7 g/cc, which is higher than Earth’s 5.5 g/cc. By comparison, Neptune has a similar mass, but a density of only 1.6 g/cc. So Kepler 10c is clearly more Earth-like than Neptune-like in composition. Of course the real mystery is how such a large planet could come to be. One idea is that the mass needed to become a gas giant is greater the farther you are from the star. According to this model Kepler 10c is just far enough away from its star that it could become massive without reaching the critical mass for a gas giant. Of course one data point isn’t enough to support a model, so we’ll need to find more mega-Earth’s to see if the evidence really supports it.